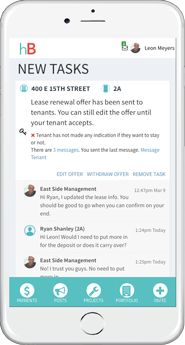 Communicate across your entire portfolio publicly or privately with your tenants and staff while keeping a record of all interactions on your profile. 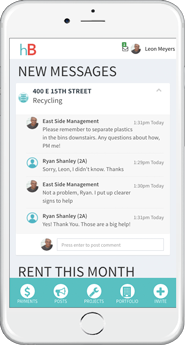 Organize your maintenance projects, tenant requests, and NYC compliance forms all while tracking tenant confirmation along each step. Manage your leases, building data, and financial records with pre-scheduled alerts and automatic reminders while centralizing all of your contacts.